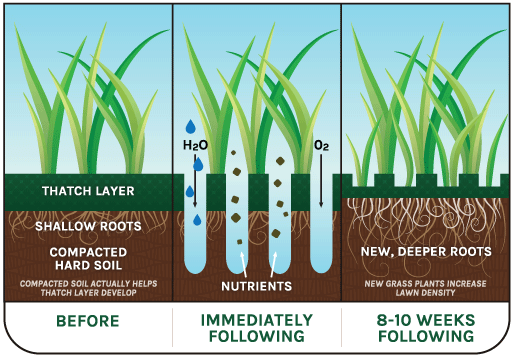 Aeration involves perforating the soil with small holes that allow air, water and nutrients to reach the root zone quicker and alleviating soil compaction. This encourages new growth and increased root development to produce a stronger, more vigorous healthier lawn. Fall is prime time to aerate your lawn for maximum benefit. Cooler weather and end of season aeration encourages root growth and improves spring green-up and growth. Most home lawns benefit greatly from annual aeration. The better your soil breathes, the better it grows. For the best results, All Seasons uses a machine that actually removes plugs of soil. Poking holes is less effective and can actually cause additional compaction in the areas around the holes. Improved air exchange between soil & atmosphere. Enhanced soil water uptake and efficiency. Creates an ideal bed for reseeding thinning lawns. Give your soil a breath of fresh air by regular aeration, your lawn will thank you for letting it breathe again. Call All Seasons for aeration prices for your yard size.